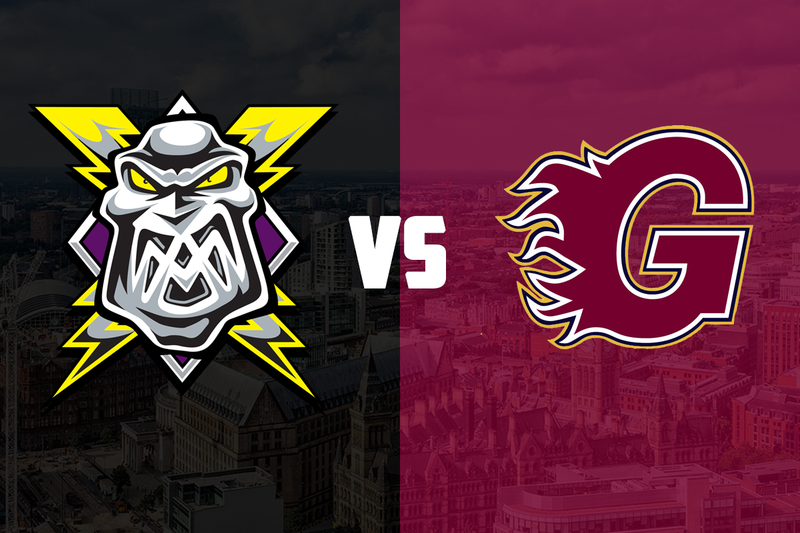 Your Go Goodwins sponsored Manchester Storm are back in action this Sunday as they round out a busy week with a home game against the Guildford Flames, facing off at 5:30 pm at the Storm Shelter. After facing Sheffield on Monday and Fife on Wednesday, the Storm traveled to Nottingham last night to take on the Panthers, while the Flames hosted league-leaders the Cardiff Devils. Both required overtime to separate the sides. 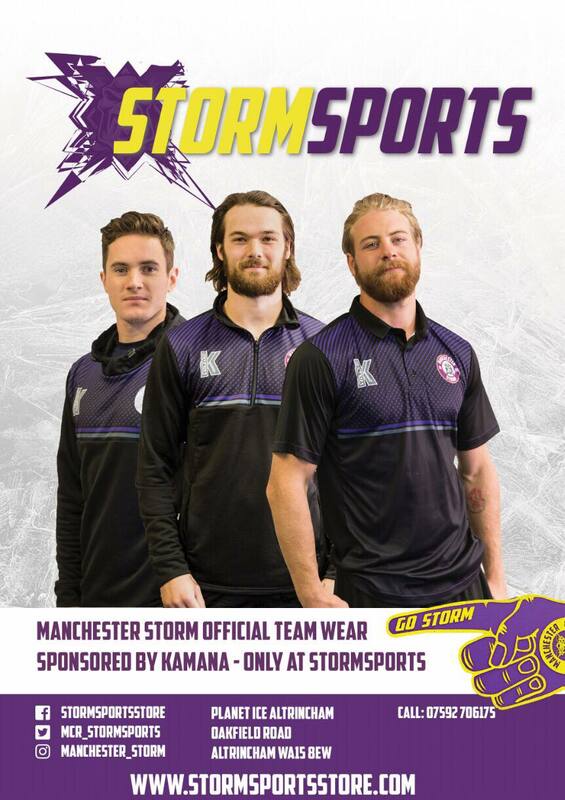 Manchester went down early in Nottingham to two quick goals, before Mike Hammond got a goal back for the Storm. The Panthers then scored another first-period goal before Hammond got his second during the middle period. A snipe from Ciaran Long with five minutes left in the game found the top corner and took the game to overtime. Unfortunately, it was the Panthers who gained the extra point, thanks to a deflected shot in overtime. Guildford had more success as they faced the Devils, winning 3-2 in overtime. Goals from Brett Ferguson and Ian Watters took the game to the overtime period, where John Dunbar won it for the Flames. This is meeting number four between the sides this season, and the third matchup at the Storm Shelter. Storm took the first meeting 6-5 after overtime in the Storm Shelter in late-September, followed by a 6-4 Flames victory in Surrey a month later. The sides last met shortly before Christmas, when the Storm were 4-1 victors at home. Mike Hammond, Matt Beca, and Dane Byers have top-scored for the Storm against the Flames, with 6 points each. Hammond scoring 4 goals and 2 assists, and Beca with 3 goals and 3 assists. Dane Byers has been the setup man, with 5 assists added to his 1 goal against the Flames. For the Flames, it’s no surprise to see Calle Ackered and John Dunbar top scoring, each with 6 points. Ackered splitting his points equally between goals and assists, while Dunbar has grabbed 5 assists and 1 goal. The Patton conference is still finely poised, with no team looking like running away with the title. Milton Keynes find themselves on top with 14 points from 14 goals, 1 point ahead of the Storm who have 2 games in hand. Coventry are in third with 11 from 10 games, while the Flames have 10 points from just 8 games. A Storm victory could move them up to the top of the conference, depending on the result between MK and Coventry this evening. One to watch: Chris Carrozzi came in as injury cover for Brian Stewart and has excelled for the Flames, often keeping them in games. His save percentage of 91.6% puts him in third in the league rankings. SOTB is #5 Ryan Trenz home shirt! 50/50 & “Chuck A Puck” will also be running! Buy your tickets from the OSC! Webcast for tonight’s game can be bought HERE. There is NO free ice skating (and skate hire) post game! REPORT – Storm come back from being 3-1 down to secure a point!